The leopard seal is a fantastic and beautiful creature that resides in the artic, donning a stunning spotted coat, similar to that of the big feline for which it’s named after. Yet this type of seal not only shares a similar appearance to the wild cat, but has an equally ferocious personality. 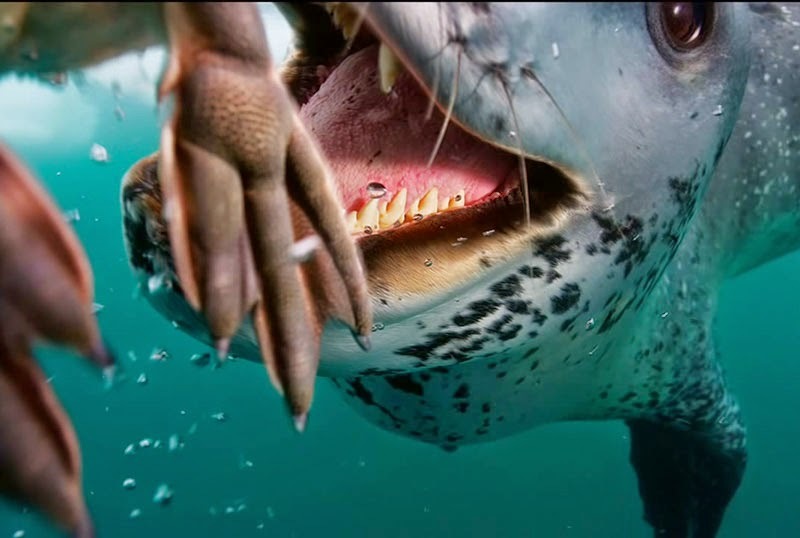 Leopard seals are renowned as being one of the fiercest predators in the artic, and are the only seal that will consume warm blooded animals, including other seals. Given this reputation, most people wouldn’t jump at the chance to come face to face with such a creature, it’s almost as crazy as trying to hug a wild lion! Especially when they’re equipped with incredibly powerful jaws, huge teeth, and an enormous 10-11.5 ft. body, weighing up to 840 pounds – yikes! But a photographer for National Geographic intentionally got up close and personal with one of these animals in its own natural habitat, and the outcome is incredible. 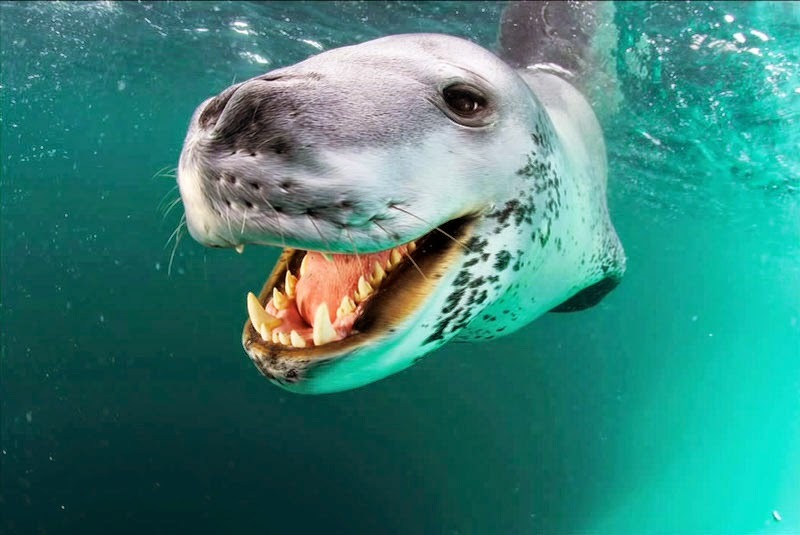 The photographer purposefully set out to Antarctica to find as many leopard seals as possible. 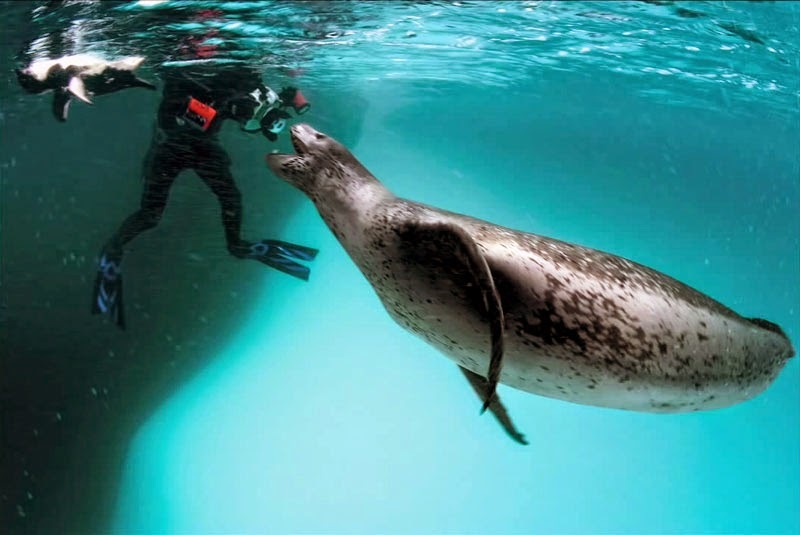 His pursuit proved successful when he discovered an enormous leopard seal in the water, his experienced companion deeming it “the biggest leopard seal [he’d] ever seen”. But instead of high tailing it back to a place where no ferocious water dwelling predators could be found, the photographer jumped straight into the icy water and came face to face with the enormous creature. While this man is undeniably brave, he was certainly aware of the risk he was taking by being so alarmingly close to a leopard seal, admittedly approaching the animal with shaking legs and a dry mouth. Yet even when the gigantic creature came straight up to him, huge mouth open and long razor-sharp teeth in full view, he didn’t flee or panic but, instead, became part of one of the most astounding experiences imaginable. 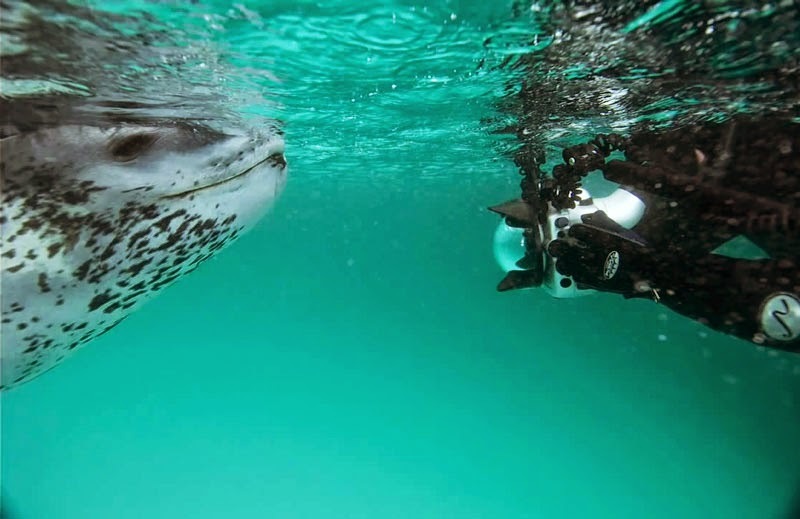 Face to face with the photographer, the leopard seal took the entire camera in her mouth and began making threat displays. However, instead of continuing to intimidate the mysterious being in her water, she suddenly retrieved a live penguin and began to try to feed the photographer the animal. She attempted this over and over again, looking almost disgusted with the photographer as countless live penguins swam right by them. He believed that she eventually figured that he was a completely useless predator, incapable of surviving by himself and likely to starve. Yet, instead of giving up and feeding on one of the many penguins herself, she began to panic. 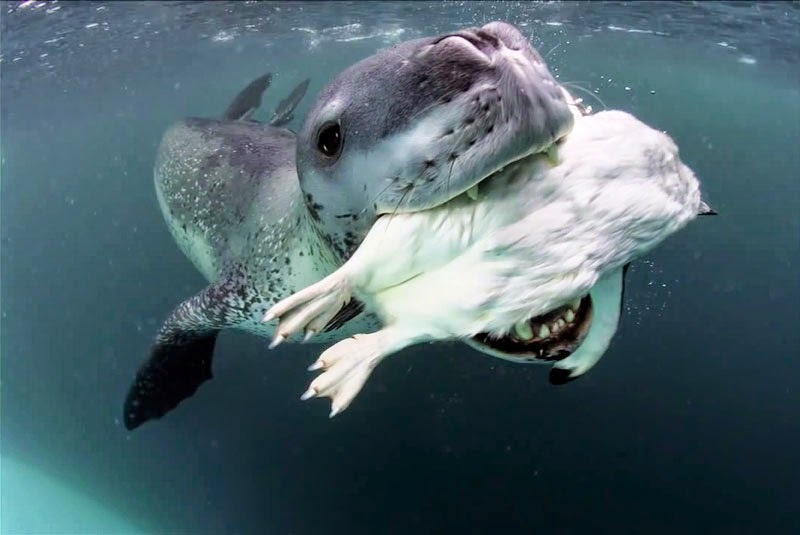 The leopard seal determinedly continued to retrieve penguin after penguin in an attempt to provide for the photographer, this time brining ones that were weak and, eventually, only those that were dead. Of course, the photographer did not consume any of her offerings, leaving the leopard seal to bring him penguins that were partially consumed. With no previous success, she even began to push the penguin carcasses towards the camera (which the photographer assumed is what she thought was his mouth) in hopes of feeding him. This miraculous behavior continued for a grand total of 4 days. It truly is unbelievable that a creature with a reputation of being so fierce and dangerous nurtured a photographer for 4 days, despite him being an intruder in her water& . 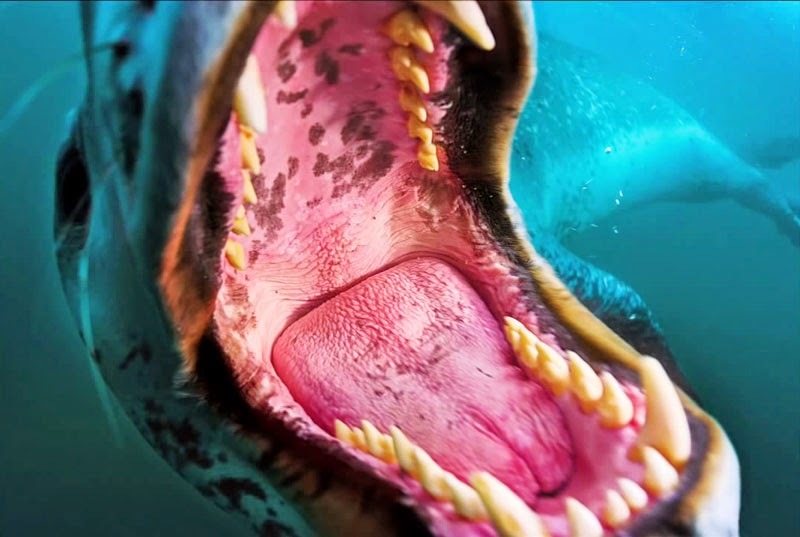 While I certainly don’t think I’d have the guts to get so close to a leopard seal, the photographer’s bravery made for an extraordinary experience and a jaw-dropping story.